The Dominican Republic - The "Happiest Caribbean Country"
Exotic Estates offers discerning travelers a boutique collection of exceptional Dominican Republic vacation villas and Anguilla vacation villas. The two Caribbean nations are very different in personality and vibe, but both are welcoming to visitors and home to a variety of superb, world-class vacation villas and resorts. This post will focus on the Dominican Republic, which was named the "happiest country in the Caribbean," by the 2015 World Happiness Report. The Dominican Republic vacation estates and villas represented by Exotic Estates are some of the finest properties available in the Caribbean. They range in size from four to eight bedrooms, with some ultra-luxury-estate homes able to accommodate up to 18 guests. With such diversity, you are certain to find a property that fits your style and group size. Visiting the Dominican Republic from the U.S. or Canada, and even Europe or South America, is relatively easy, with well-established air and ground transport options. As a point of reference, flying time from New York City to Punta Cana or Santo Domingo is only about three and one half hours. There are definitely peak travel seasons for the Caribbean and pricing will fluctuate throughout the year. If you are able or interested in traveling during the spring and summer months up until Thanksgiving week in the US, you will likely find very attractive price points in most locations. In addition, with average annual temperatures ranging from 75 – 85 degrees Fahrenheit, you are pretty much guaranteed beach weather all year long. In the Dominican Republic, our vacation villas are clustered in a few in-demand areas offering excellent services and area attractions. Most are in the South, in the Punta Cana Resort and in Cap Cana, which offer gated villas, while a few are located up on the North Shore, near Cabarete, a world-class kite surfing destination. I asked our specialist about some of the best features that the island has to offer and also about considerations that many U.S. and Canadian travelers may have when renting a villa in an international destination like the Dominican Republic. What are some of the available services and activities that guests staying in our villas in the Dominican Republic enjoy or take advantage of the most? A. While the answer really depends on the traveler, families often like to stay at the Punta Cana Resort and Cap Cana (gated villages) since there are many activities to enjoy inside the resorts such as horseback riding, various water sports, fishing, zip lining, hiking, mountain biking and other activities. Also, there is a full-range of available services for our guests. Villas typically include daily maid service and bathroom amenities. In addition, our guests receive a one-way complimentary transfer to or from the airport, a fruit basket on arrival, private check-in at the property and welcome beverages. Add-on services available to guests include babysitters, private chefs and in-villa massages. Really, we cover everything that most people want or need when on vacation. Lastly, a popular and unique place to visit inside Punta Cana is the nature reserve where guests can learn about the local fauna and flora, and enjoy a swim in pristine freshwater ponds called Ojos de Indigenas. In addition, there are also golf courses, so it’s really a nice balance of activities for everyone in the group. Outside of the resort villas, the lively town of Bavaro has lots of bars and restaurants, so if people want to go out for a special dinner or to party, there are plenty of options. The villas are located in resorts. What are they like? A. The resorts are essentially like gated villages designed around relaxation. Imagine a small city without large supermarkets or banks, but with lots of social activities. The resorts offer not just one club-house, but many, since each golf course has its own club house with pool, spa and shop. Both, Punta Cana Resort and Cap Cana house many bars and restaurants, and even a disco. Can you speak to the security of the villas and the resorts? A. All gated villages and resorts have guarded entrances. Police are always present, mostly on the roads, but it’s important for people to know that Punta Cana is a very safe place. A.The nearest hospital is about a 15 minute drive from the resort villages. Each of the resorts will also have a small medical clinic for minor needs. What is the most popular time of the year for renting villas in the Dominican Republic and how far in advance should people think about booking them? A. Christmas and New Year’s Eve by far, followed by Easter. For Christmas and New Year’s, people should plan at least six month in advance. Are there any special advantages that the Dominican Republic offers the American or Canadian tourist? A. Ease of access is one of the most important advantages, as there are direct flights to the Dominican Republic from many North American cites. Also, the security and tranquility of the island are important selling features, as are, of course, the Dominican people, who are amazing and full of life! 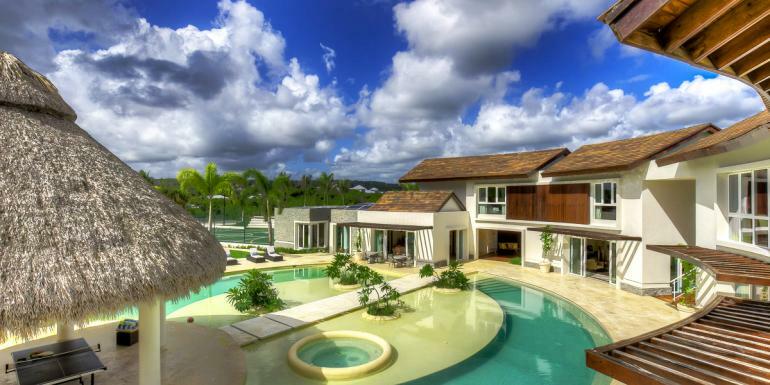 Click here to view all of the amazing and luxurious vacation villas that Exotic Estates offers in the Dominican Republic.